Have You Heard of Augmented Translation? The days when the main tools available to translators were pen, paper, and a dictionary are long gone. The days of using translation memory as the main productivity resource also seem to be nearing their end. With so many different tools and technologies available on the market, let’s not forget the most important part of the translation process – the human. Progress in technology means that translators have now gained access to an unprecedented array of aids such as translation memory, terminology management tools, briefing materials, visuals, context information, as well as machine translation and many others. At TranslateMedia, this translates into the integrated Online Editor interface where translators carry out their work. 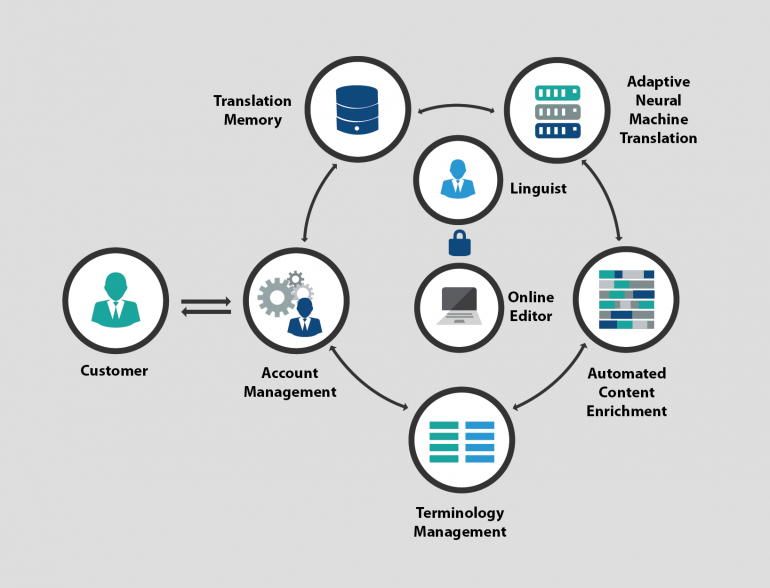 They have access to several modules that enhance the translation process, as illustrated in the graphic below, but they are still the ones who remain at the very core of the process and stay in control. Translation Memory module, where linguists see any matches coming from the translation memory relevant to the text being translated. This also allows for concordance search, in other words looking up how a certain term was previously translated together with the context. All of the above modules augment and complement linguists’ mental processes involved in translating. The term “augmented translation” is not entirely new. It has been coined by Common Sense Advisory (CSA), a research company specializing in the area of translation and localization. CSA has drawn inspiration from “augmented reality”, meaning phone, tablet, headset applications overlaying images of the world with additional information like sensory data. Pokémon Go comes to mind as a good example, but the same approach has also gained importance in industrial applications. In the same way, augmented translation leverages the technology available to allow translators to increase their efficiency and gain more control. The idea is for all the individual components to “talk” to each other but also learn from the linguist. Machine translation, for instance, uses translator’s corrections to learn new translation patterns and therefore improve over time. In practical terms, what it means for the translation industry is that companies which embrace the idea of augmented translation and incorporate it in their daily operations, will see a considerable increase in performance that will improve further over time as the systems learn from individual linguists, project managers and customers. It is an exciting time to be part of the translation industry, both for language service providers and linguists.